So my task this month is to finish TWELVE stained glass mobiles. I’m glad to say that I’m just about there with two days to go. Meanwhile, I’ve already chosen my birthday present – a glass painting workshop to review my skills in that area. But I’ll have to wait until April. Along with making mirrors, I’m really enjoying a return to my first artistic love after a break of some years (no pun intended!). Glass is a wonderful and versatile medium that captures light, colour and emotions. 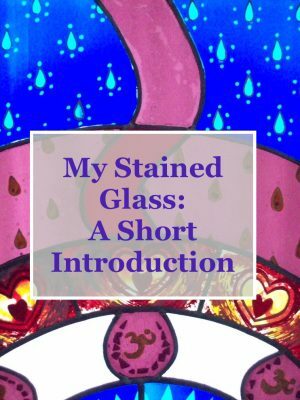 I first became interested in glass art when I met an eccentric local character in 1990s London. And asked him several times to get a little class together. By his own admission though, he would’ve been an impatient teacher. Hence he recommended a friend of his who ran a class at the local adult education college. Stained glass is the name given to windows that contain a lot of painting. Here the paint is fired in stages, from outline to shading and maybe more. Visit many cathedrals and churches which have figurative work and you’ll see evidence of it. From Medieval to Victorian and right up to date in modern pieces, there’ll be painted glass. I’ll be revising this at my birthday workshop. A stained glass panel may also include elements of sandblasting and acid etching, both effective techniques that eat away into the surface to create texture. Or, if you’re using flashed glass, another colour underneath. 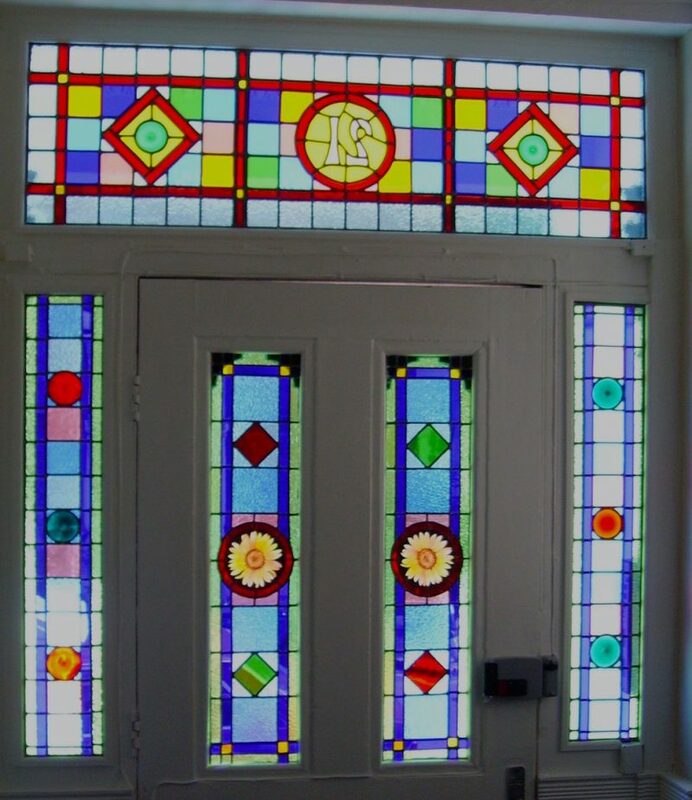 Meanwhile a leaded light is a simpler panel of clear or coloured glass held together by lead, like the purple and blue star panel above. When clients ask for some stained glass for their home it’s likely they mean this. More than often not they want a piece with different coloured and textured glasses with an eye-catching design, but don’t have the budget for a pice with multiple firings. They want a leaded light. Fast forward several years and here is a front door I designed and created for friends a few years ago. And it contains elements of both stained glass and leaded light. The sunflower roundels are painted and subsequently fired, which I outsourced since I knew that the glass artist would make a much better job of them than I would. Roll on my painting on glass workshop, because this is just the kind of work I’d like to move towards as the year progresses. Needless to say, seeing this installed in a west London street was most rewarding. And while I wish I’d painted the sunflowers myself, I was nonetheless happy with the overall effect. The explosion of colour brightened up a dull vestibule and lit up the garden path at night. Likewise, it’s a kick when a well-known and respected glass artist likes your work on Instagram! So much so that I’m including the link to the page itself. I created this standing screen for my degree show at the University of the Arts in London. Where, incidentally, the aforementioned glass artist Brian Clarke himself came in to give us a talk. We had to make a site-specific piece. So I visited a north London Hindu temple and asked if there was somewhere in the building where they could imagine some decorative stained glass (with no obligation to purchase). They suggested that a piece of glass art would suit the wedding room. For years this piece stood in my flat. I wouldn’t sell it, enjoying the beautiful colours it threw all over the room each bright morning. I finally sold it to friend when I left London rather than risk it being damaged in transit. It was sad to say goodbye to it after nearly twenty years. But I’m excited about the work I will create to take its place and the new skills I will develop. Have you seen any amazing stained glass or glass art on your travels? Or do you have some installed at home? Let me know in the comment section.